These are super simple. You can easily whip up a dozen in an hour or so! 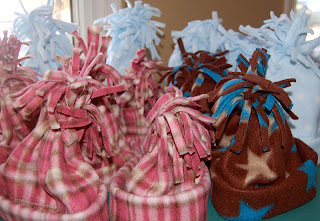 From a yard of fleece fabric, you can make 6 baby/toddler hats. If you want to make bigger hats, get 1 1/4 to 1 1/3 yards to make four teen/adult hats. Your fleece should be approximately 60" wide. 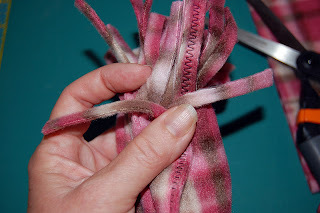 It will be stretchy between the two selvages. Keep that in mind, which way it stretches. We want the stretchy part to go around the circumference of our heads! 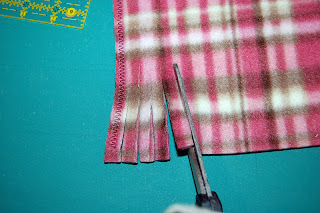 Trim off the selvage edges. 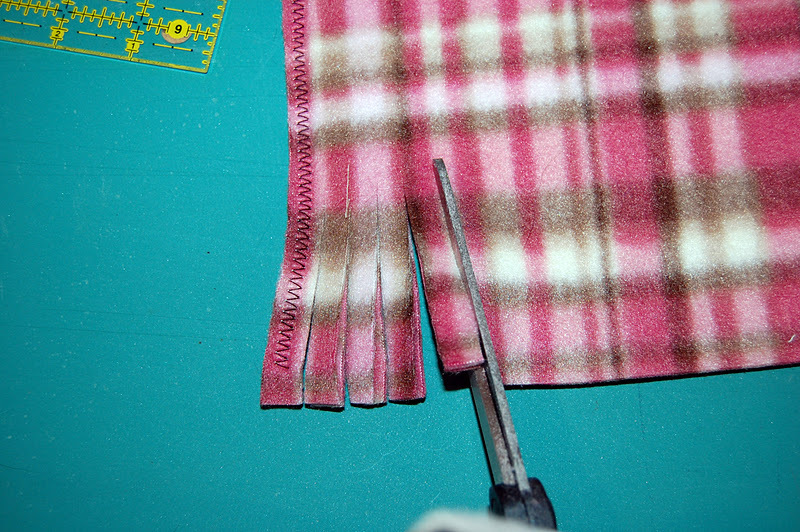 Cut the fleece into two pieces, 60" x 18". Cut each 60" long piece into 3 pieces, about 19" wide. You should now have 6 pieces, 19" x 18". 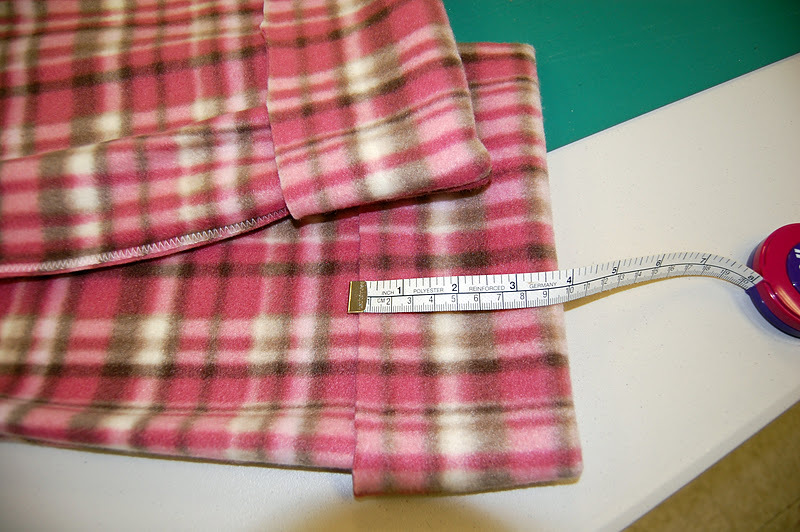 Fold each piece in half, right sides together, with the 19" sides together. 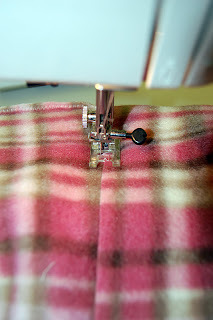 (If your fabric doesn't have an obvious wrong or right side, don't worry about it. 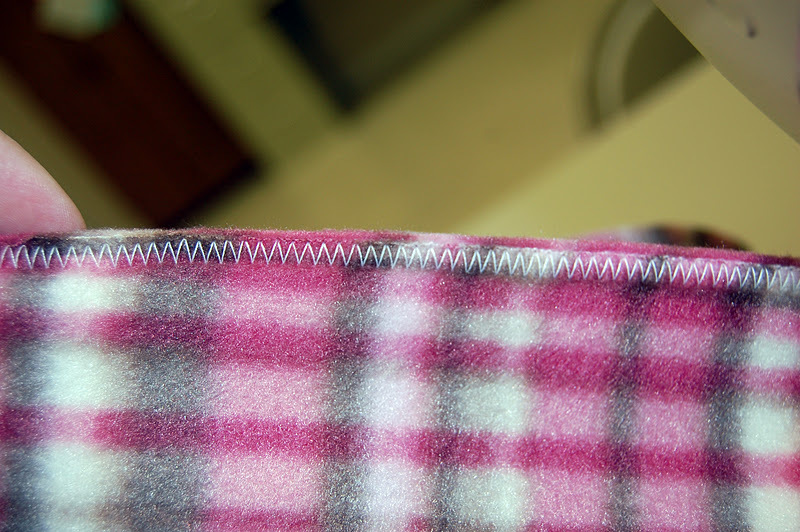 However, just a little tidbit, if you gently tug on the stretchy side, the edge of your fabric will curl. The curl will point to the right side. Fascinating, eh?) Using a fairly large zigzag stitch (I used the size that my machine defaults to, w 5.0, l 2.0) stitch the seam up. You're stitching up along the non-stretchy way. Make sense? You can chain piece these, then snip apart. 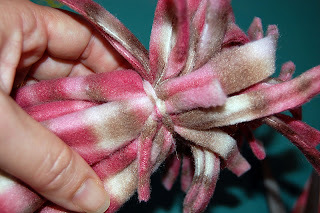 Near the seam, take two neighboring fringe pieces, wrap one to the left, one to the right, scrunch up the hat, and using the fringe pieces, tie them together around your bundle of fringe to make a pom pom and close up the top. Fold up your cuff and you did it! These would make a great charity/community service project. Easy enough for kids to get involved. Have fun with them. Oh, and did I mention, they're super warm and cozy? Bonus! Thanks so much, this is just adorable!!! 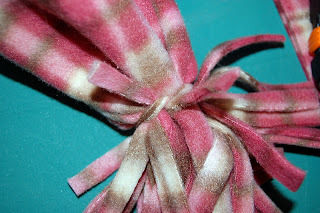 i think i have some fleece left from making fringed scarves last year - these look fun! They are so cute and sound easy. Thank you. Thanks for the tutorial! I can get remnant fleece pretty cheap and so I buy it because the fabric is so cute...but then never know what to make....these hats are adorable! I love them! I just wanted to stop by and let you know that I just made one! It was soooo easy and only took a couple of minutes! I just finished a camo fleece crib set for a lady (comforter, bumper pads and some nursery pillows) I made one of these hats with the leftover fleece....just a little extra surprise for her! I posted the camo bedding on my blog earlier this evening, I will post the hat one there maybe tomorrow! Thanks so much! Congrats for being chosen for One Pretty Thing!!! That is so cute! Thanks for a great beginner project, just my speed! I just made one. It really is super easy. I am going to make a bunch for charity. Thanks for the great idea!